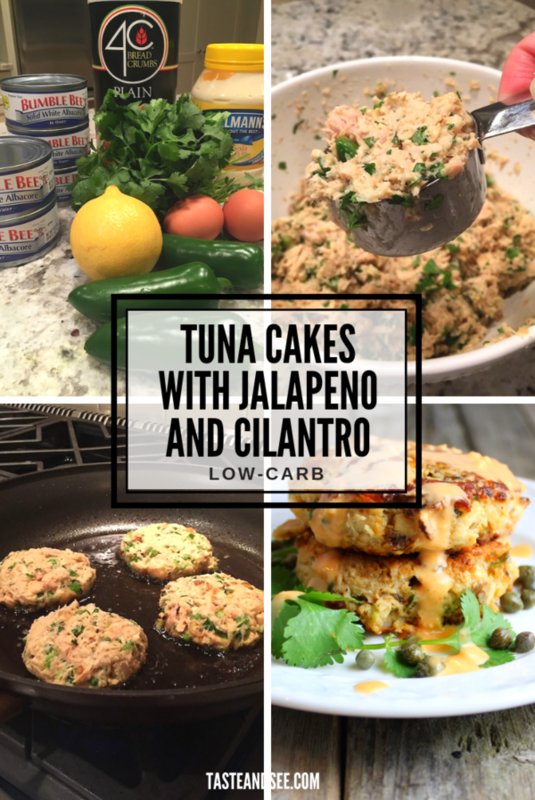 These yummy Tuna Cakes with Jalapeño and Cilantro are low on carbs and calories and big on flavor! 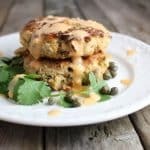 Simple, easy tuna cakes from a can! These tuna croquettes can also be gluten free and just as delicious if you swap out almond meal for the breadcrumbs. Plus, they are made from canned tuna so they’re totally budget friendly! I know you’re gonna love them as much as I do! This post contains affiliate links… read more here. The one thing we all have in common is our need to fuel our bodies – all the time. It never ends. The sun will rise and many of us will stuff our face at least 3 times a day. Sometimes I get tired of eating. Wouldn’t it be easier if I could just hook up an IV and keep on stepping? Well, maybe it’s not the eating that I get tired of but the preparing that sometimes wears me out. Can I get a woop woop! If I really think about it, it’s not me so much but other “people” that live in my house that require, let’s say, more variety and really just substance. And by substance I guess I mean protein! I know I’ve mentioned Sanderino’s carnivorous ways previously. Truthfully, I swear I could eat a salad or soup for every meal, err day – yep – even breakfast. With a side of coffee of course! When the B man travels it’s a bit exciting, I’m like – woohoo – roaster chicken and arugula salad every night!! Less time pulling feathers off chickens and more time checking out food blogs and watching Poldark!! Oh Poldark. 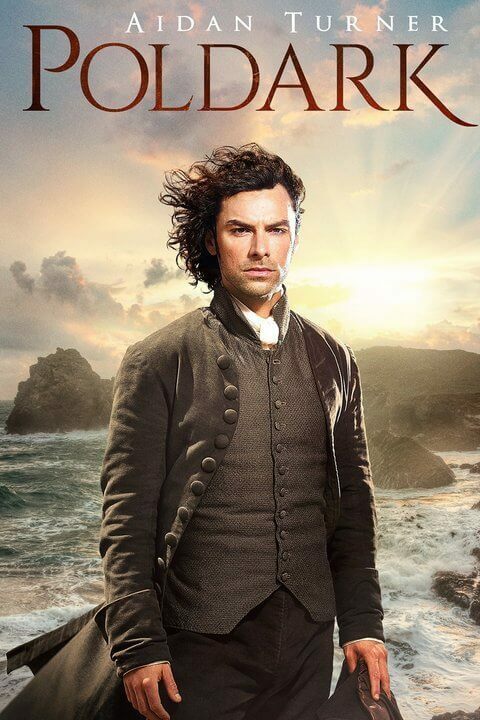 I must digress for a quick minute…I’ve mentioned Poldark before but I’m not sure I did it justice. And I’m concerned that you may be missing out on, well, one of the best TV series to come along since color TV. People for the love of PBS, Mr. Darcy, and Downton Abbey – click here for Season 1 of the most amazing, tea-drinking, family-feuding, horseback-riding show in the history of time . ✨✨ Is my minute up? Is anyone keeping track of all the fantastic tips I shower you with?? #humblebrag. 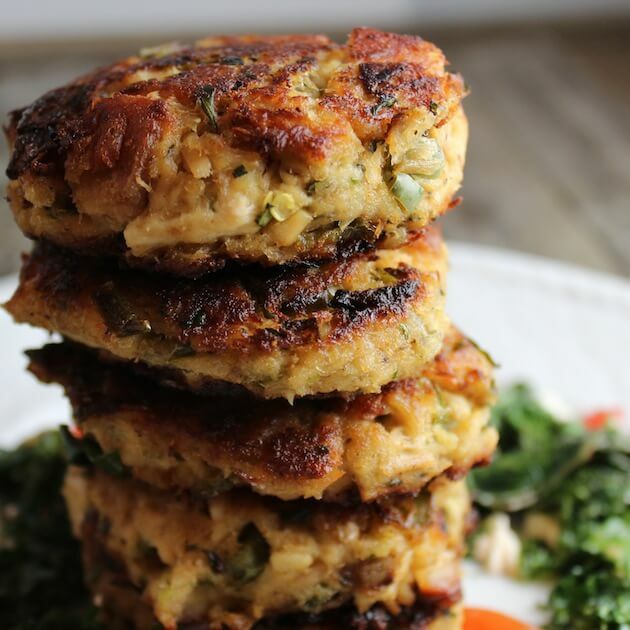 These Tuna patties are a huge time saver! Basically it comes down to the simple fact that life is busy. Our time is very precious, and a bit elusive. We all need quick, easy, inexpensive, delicious, recipes to make for easy weeknight dinners. Like, for example, my Tuna Cakes. Think crab cakes but way cheaper, less seafoody and more tasty. 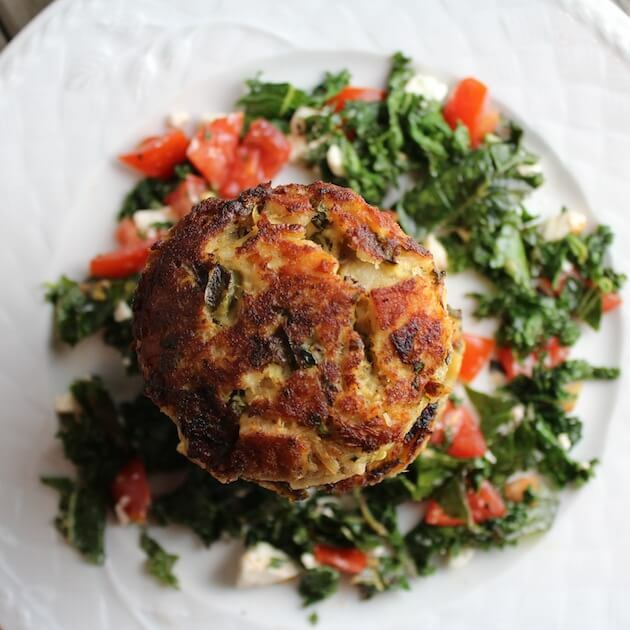 These Tuna Cakes are so easy and mouthwatering I just had to share the recipe with you. I’ve been making them forever. They are super quick to mix together and they take just 3 minutes a side to cook in my trusty non-stick pan . In case you’re worried about them being spicy, when you remove the seeds and veins from the Jalapeño you’re basically removing the heat. After it gets cooked, it ends up with an earthy green pepper flavor. If you’re still not convinced just use a green pepper instead. You do you. The greatest of all canned tuna recipes! You may be surprised to know that you use canned tuna for these meaty biscuits. Yep – that’s the inexpensive part. Interestingly enough, people that don’t really care for seafood always like these Tuna Cakes because they’re related to our old friend that we all grew up on: tuna salad sandwiches! If you didn’t have that experience, I’m sorry… there’s no time like the present, so get on the tuna train! First stop – Tuna Cake Towne! Let’s go! PS: I like to serve my Tuna cakes over a simple Arugula or Kale Salad. 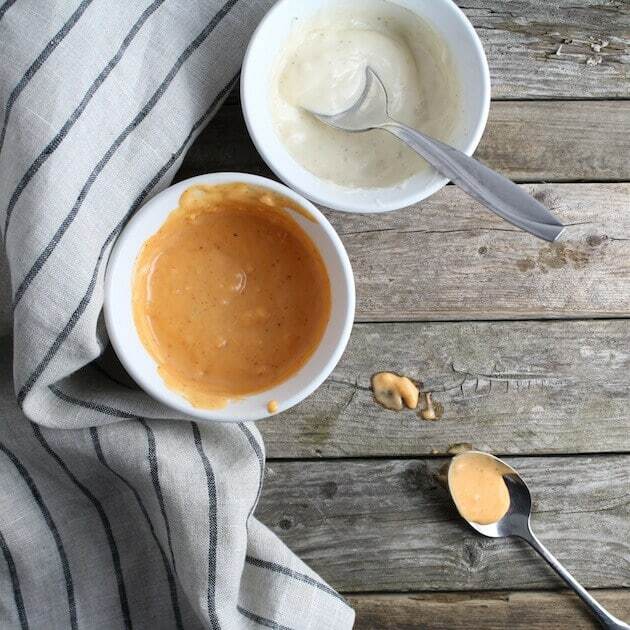 If you’re a saucy kind of person you can make a simple Aioli for them with mayo and lemon juice. And if you’re a little spicy throw in some Sriracha and cayenne pepper and get turnt up! In a large strainer, in the sink over a large bowl, add the 5 cans of tuna and let them drain while you prepare the following ingredients. Sauté the onions for about 8 minutes in a sauté pan, until translucent. Set aside and let cool. While the onions are cooking, in a large mixing bowl, add the mayo, lemon juice, salt and pepper and whisk till combined. Then add cilantro and peppers to the mixture. Add the tuna, beaten eggs, cooked onions and breadcrumbs, and mix gently until ingredients just hold together. 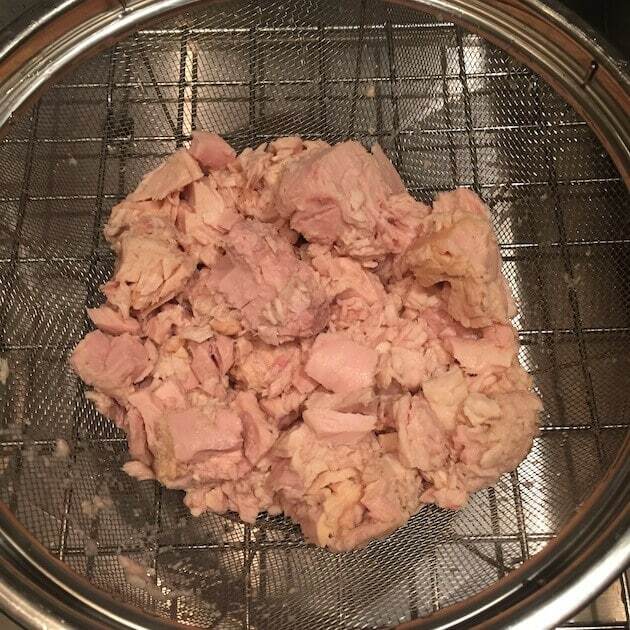 Working in batches, using a packed one-third cup measure of tuna mixture per cake, cook cakes until golden brown and crisp on the outside, about 3 minutes per side. You may need to add a tablespoon of oil to the pan between batches. 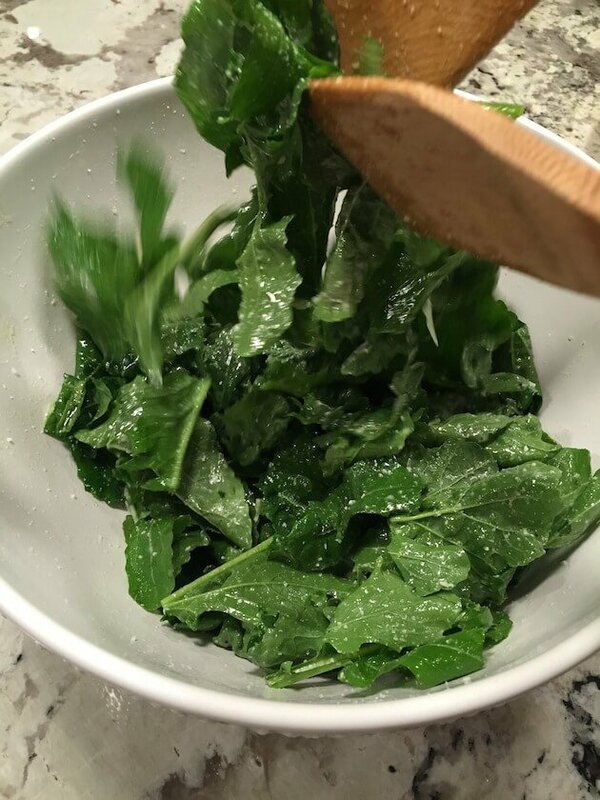 Serve hot, or warm over a simple arugula or kale salad. Recipe makes 14-16 patties. Scoop the tuna mixture with a one third measuring cup, pat it a little to make sure it's formed tightly, then place it in the sauté pan. Use a grease screen to cut down on the oil splatter while cooking the cakes. Don’t overcrowd the pan when cooking the cakes. They will take longer and flipping them over will be more difficult. I use a 10inch Calphalon pan and cook 4 patties at a time. There is not much filler in these cakes, which makes them a little loose. Be sure to gently flip them over when cooking. If spicy isn't your thing, just omit the the Sriracha and cayenne. Whisk together all the ingredients in a bowl. Cover and refrigerate for at least 30 minutes before serving. These are the bomb!!! It’s like gourmet tuna. The flavor is incredible. Thank you so much for sharing this recipe!!! Greatly appreciated. Thanks so much, Angela! I’m so glad you enjoyed the tuna cakes! I love the flavor of these as well. Can this be baked instead of fried? Hey Judy, I haven’t tried this recipe baked but you could give it a try. Made these a couple weeks ago when my mom visited and they were so so good!! Made them again tonight but experimented with pepperoncinis instead of jalapeños and they are still delicious!! Also— I found that 1/3 cup was a bit too big for me so the second time I used a 1/4 cup and it’s perfect. Thanks so much, Suzann! Pepperoncinis sound like a yummy swap! Good to know about the portion size. I appreciate you taking the time to share your feedback! This looks great. Does it have to be canola mayo or can I use Olive oil mayo instead? Thank you, Jenn! You can use any mayo you like.👌 They will be delicious! I can’t find anywhere how many patties are in a serving. Is it just 1? Hi Renee, Sorry for the confusion. You are correct – one tuna cake is one serving. Has anyone made these in an air fryer? Good question! Not that I know of but maybe someone that has will chime in. That’s great to know, Kathy! I haven’t worked with an air fryer much but I think that needs to change. Thanks for stopping by and sharing your experience!! I made these cakes today and I was amazed by the mixture of flavors I got from the onions, cilantro, and the jalipeno peppers and then more flavors from the aioli sauce . All together the flavors We got from these cakes was more than I could imagine. Thank you for sharing your recipe. I still had some left over mixture and I’m certainly going to look forward to my dinner tomorrow. By the way, placing the cakes on a bed of arugula with the sauce mixed in was a nice way to finish my dinner. Hi Richard, it is all my pleasure! I agree with you that all those flavors combined makes an amazingly delicious combination. Thanks so much for taking the time to share your feedback with me! These are super tasty and wholesome. Making them again for dinner tonight. I love hearing that, Rizi! Thanks for taking the time to share your experience. They are one of my all time favorite recipes! So glad you’re enjoying them. 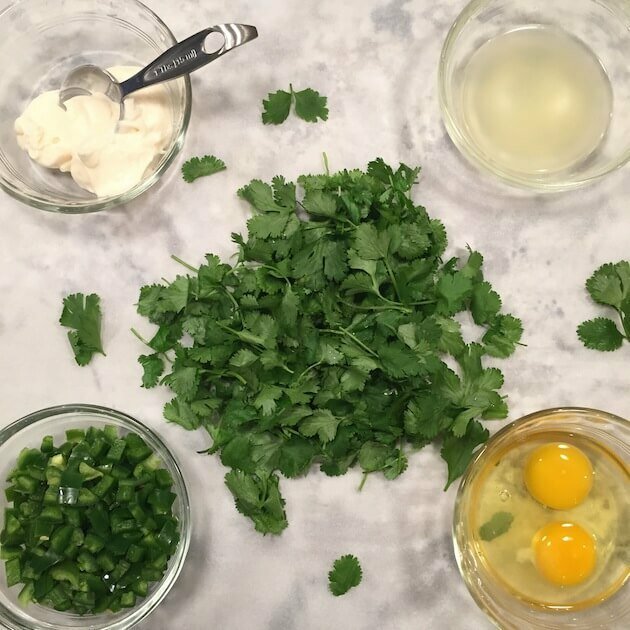 What is the mayo/cilantro mixture for? You give directions on it and then never mention what to do with it. Is this a sauce, the filling? So confused. Hey Andrea, sorry this is so confusing for you. All of the ingredients for the tuna cakes get mixed together including the mayo/cilantro mixture. Then you form your cakes and cook them until browned and crisp. Hope that helps! Yes, the second recipe is for the Aioli dip. 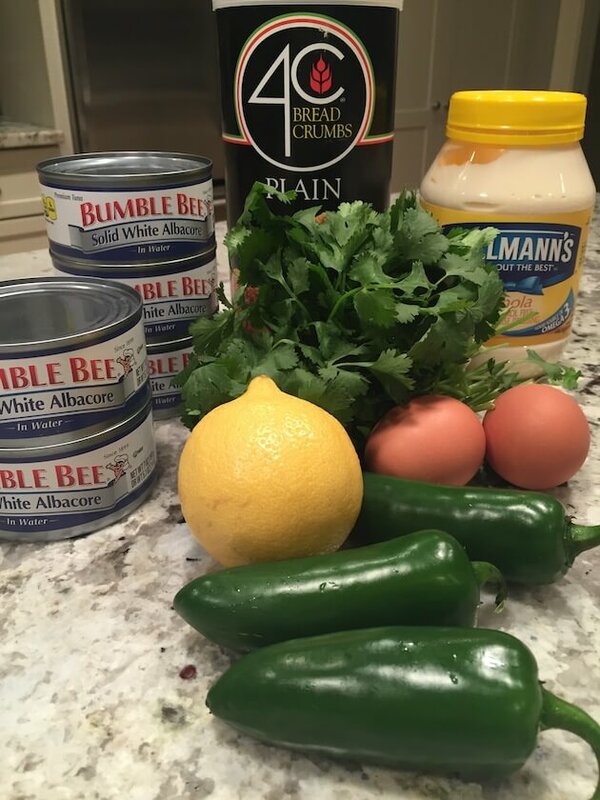 My family and i have had the privilege of enjoying your recipe for tuna cakes in the past and are about to have them again tonight! They are absolutely delicious! THe flavors and texture are on point! I appreciate this recipe so much!! Yummy!!!! Yayyy! I love hearing that, Amy! I’m so glad it’s become a repeat recipe in your house. Thanks for your kind words and for taking the time to come back and share your feedback with me. I’m so grateful! 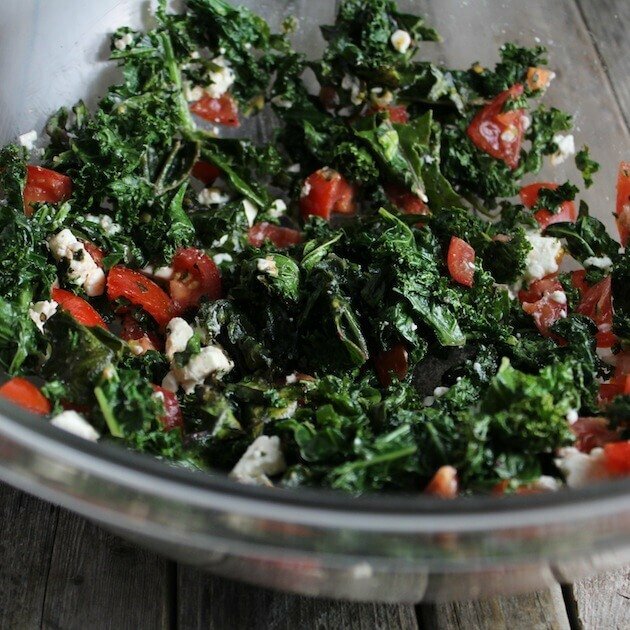 Have you ever made half of this recipe and if so, what were your measurements for each? Thanks in advance for your info. These look yummy and I can’t wait to try them. Hi Rebecca! My recipe card has a feature where you can adjust the servings for yourself. Just click on the little blue number next to the word “servings:” in the recipe card, and make it the number of servings you would like it to be. That will adjust all of the ingredients for you. Thanks and enjoy! These are amazing! One question. Do you think I could mix all this up ahead of time, pat out the patties and refrigerate them for a couple of days then cook them? TIA! Hi Jamie! I think they would be ok for 1 day but probably not too much longer after that. I would recommend cooking them all at once them reheating them through out the week as you need them. Hope that helps! Is there any way to subsitute the eggs? Hey Miranda, I’ve heard of others using flaxseed as a binder. Here’s what I found to be an 1 egg equivalent… 1 tablespoon ground flax seed mixed with 3 tablespoons warm water; let stand 1 minute before using. Hope that helps! I just made these awesome cakes! I did add in some lemon pepper seasoning, along with Lawrey’s seasoning salt. For a filler, I used crushed pork rinds, adding in some grated parmesan cheese. I then coated the patties with the pork rind mixture, seasoned with Lawrey’s prior to frying. Virtually carb free. Amazing! Thanks for the recipe. Does anyone know how these would hold up for meal prepping? Thanks! Hey Lauren! I think they work great! I always make the full batch (which is a lot for me and Bryan) but it works out perfect to have them ready to go for lunch all week. Hope that helps – enjoy! I made these tonight with a 50/50 blend of oat flour and flax meal and green onions. My 4 & 5 year old girls ate 3 each and asked if we could have them again tomorrow! The oat/flax meal mix kept them very sturdy and I loved the aioli. Thanks for the recipe! Hi Patricia! That’s so awesome! I love that your kiddos enjoyed them so much! It’s my pleasure and thanks for taking the time to share your feedback! These sound great! Do you think I could use almond flour for the binding? Thanks so much! I think almond meal would be a little better because it has a more course texture but almond flour would probably work too. This looks delish!! Would you consider this a low cholesterol meal? Hi Sue, Thanks so much! I’m not up to speed on the requirements for a low cholesterol meal. This recipe does have 2 eggs, olive oil for saluting the cakes and either mayo or Greek yogurt for the aioli. If I was following a low cholesterol diet I would use egg beaters or egg whites instead of whole eggs, bake the cakes instead of frying them, and use nonfat greek yogurt inlace of the mayo. Here’s a healthy baked version of these same cakes that might be just what your looking for: https://tasteandsee.com/healthy-tuna-cakes-with-spicy-lemon-yogurt-sauce/ I hope that helps! Just made a large batch of these and I am in love with this recipe! I take a tuna cake to work every day on a bed of spinach and arugula with cilantro salad dressing! I did substitute flax seed meal for the breadcrumbs. I’m making these a second time! Will probably become a regular in our menu rotation. I substituted the breadcrumbs for flax meal and it worked great! I’m so glad you enjoyed them, Angela! Flax meal sounds like a great substitution for the breadcrumbs. I’ll have to give it a try. thanks for the 5-star rating and taking the time to give me your feedback! These are delicious! I added chopped up celery for some extra crunch. Yum! Hi Nikki! I love that you added some celery for more texture! Thanks for stopping by! Could you sub out the breadcrumbs for shredded Parmesan cheese to make them atkins friendly? Hi Morgan, I say give it a try. Or you could use almond meal instead of breadcrumbs since it’s basically just almonds ground up really fine. Good luck! I followed the recipe to a T and absolutely loved these! Such a great recipe- and it’s Whole30 compliant (sub almond flour and without the aioli). Thanks! Hi Lauren, I’m so glad you enjoyed the Tuna Cakes! Thanks so much for taking the time to give me your feedback. And thanks a ton for the 5-star rating!! This recipe is amazing! 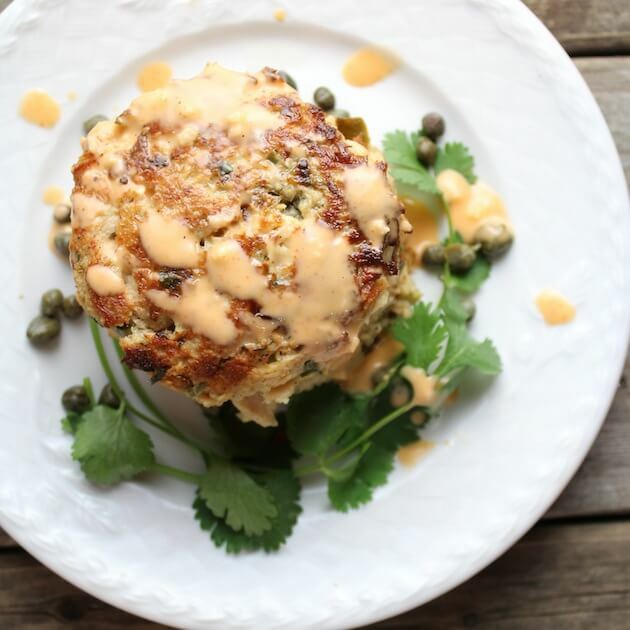 I love making these Tuna Cakes! I sub green onion for regular onion because I like the milder flavor. I usually cut the recipe in half, this time I only had 4 cans of tuna and made 12 cakes. I love the jalapeño/cilantro/green onion combination! This recipe is amazing and so flavorful, this is one I will make again and again. Thanks so much, Katie! It’s all my pleasure! I love hearing that people are enjoying my recipes! Take care. Just made these tonight for dinner…served over a salad for me and with sweet potato fries for the others. YUM-O! I halved the recipe and it worked perfectly. Thank you for sharing! These look amazing! Can’t wait to try them at the weekend. Could you do them without the breadcrumbs or is this an essential ingredient? Thanks so much, Dani! The breadcrumbs are an essential ingredient that helps them stay together. If you don’t want to use breadcrumbs you could try some ground up almonds, almond meal or flax meal as a replacement. Good luck making them this weekend and enjoy! Amazinggggggggg!!!!! Loved the recipe !! Just made it but realized it says 1/3 cup of breadcrumbs but in the other page it says 3 cups. Can you just clarify that with me please ? I made It was 1/3 and they came out great! Although they were falling apart a little bit . Do you suggest I use more breadcrumbs ? Also can I use coconut oil instead of olive oil ? Thank you again for sharing this deliciousness ! Hi Karen! So glad you enjoyed the Tuna Cakes! The recipe should say to use 1/3 cup breadcrumbs. If they are falling apart you can use a little more to help bind them together. I usually just press them together really good with my hands before I cook them, and try not to move them too much while they’re cooking. Coconut oil would be a great oil to use instead of olive oil. Thanks for your kind comment and taking the time to stop by and write it! I’m on weight watchers and I was wondering get if you could give me the full nutritional information on these. I thought I saw someone say it’s 136 cal but I need total fat etc. I hope to hear from you soon. Thank you in advance. I made these tonight and they were superb! I substituted pickled jalapeño since I didn’t have lemon juice and added some celery to saute with the onion. They were light and yet filling…new staple for our fam! Hi Billie! I like using some pickled jalapeno in them sometimes as well. Just thinking about them is making my mouth water. So glad you and the family enjoyed them! Thanks for stopping by to share your feedback and the 5-star rating!! Woot Woot! Can I use Avocado mayo in this recipe?! Maybe drizzle Avocado lime cilantro dressing on top? Hi Amanda! That sounds AHH-mazing! 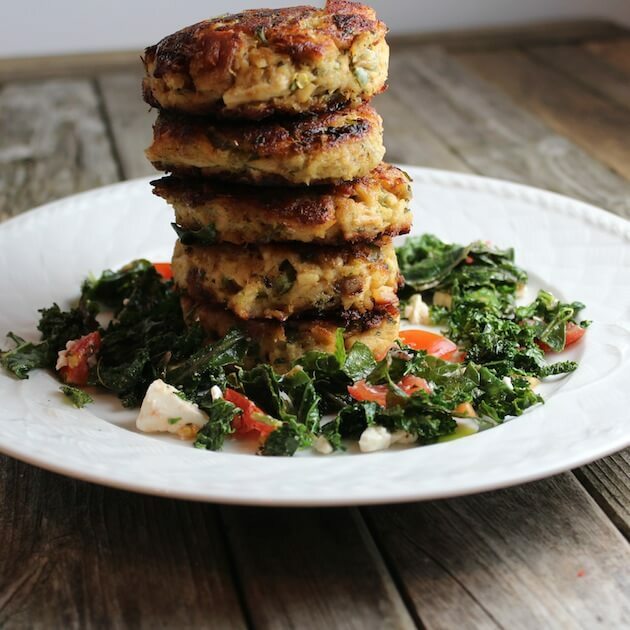 All of those flavors sound perfect for these Tuna Cakes! Thanks for the great suggestions! These are AMAZING. I made them last night and my husband gobbled them down like I was going to steal them from him. I am wondering (for the future) if I could substitute the mayo in the Siracha Aioli sauce for greek yogurt or sour cream. Let me know what you think. Once again, these are so yummy. Thank you for sharing your secrets with the world. I don’t usually comment in recipes, but this is such a fantastic recipe and I just had to say thank you! I made these last night (without the sauce, as I only just saw that add on!) and they were amazing! Such great flavor and I love the crunchy fried outside! I can’t wait to try them again with the sauce! I used the almond meal and my first batch wouldn’t hold together well at all. I added about 2 tablespoons flaxseed meal and they held together much better, without becoming too dense. This is definitely a new favorite, budget friendly recipe for me. Thank you for creating such a simple and wonderful recipe! Thanks so much, Jillian! It is all my pleasure! I get excited when others enjoy a recipe as much as I do. I’m thrilled to hear you enjoyed the tuna cakes so much! Thanks a bunch for taking the time to share your feedback! Take care! Really excited to try it’s recipe! I like that you’ve posted the calories too but I’m wondering what the serving sizes are. Are the calories per tuna cake? And what would be a serving for the sauce? Thanks! Hi Jordan! Thanks for asking that – we updated the recipe to clarify that a serving size is one tuna cake. Each tuna cake is 136 calories. Also the Sriracha Aioli is about 3 teaspoons per serving, and that’s another 92 calories per serving. If you use light mayo in the aioli, the calries per serving drops to 42 cal per 3-teaspoon serving! Hope that helps and enjoy!! I’ve made these 3 times now as written with the exception of the cooking method the 3rd time. 1st- Used Greek yogurt instead of mayo. Delish. 2nd- Used mayo. It was alright. 3rd- Used Greek yogurt and baked. It was somewhat dry and it was indeed hard to get the golden crisp you get when frying in the pan. I kept it in longer to see if it would form the crust so they came out kinda dry. Regardless, this is a really good recipe. Love me some tuna patties! I would love to see a baked version of this! Yes – me too, Laura! It’s in the works!! Coming to the blog soon! IM GOING TO HAVE TO TRY THIS RECIPE!!! For sure, Lisa! They are so yummy!! I am excited to try this. Could you substitute the tuna with crab? Yayyy! I hope you enjoy them as much as we do! I’m sure you could sub out crab for the tuna. You may need to adjust the bread crumbs and mayo a bit. The crab will probably be a little dryer than the tuna so most likely less breadcrumbs will be needed. Enjoy! I made these a few nights ago after seeing this recipe on Pinterest. I must admit, I had tried a few other recipes from the Internet the week or two prior and was let down every time so I didn’t have high hopes for these – I was just desperate for something low carb that wasn’t chicken or hamburgers. All I can say is wow! These are fantastic. Husband is out right now getting more tuna so we can have them again tonight. The sriracha sauce is an excellent condiment for them as well. Highly recommended. These were delicious. Thanks for sharing. Great to hear, Karen! So glad you enjoyed them! I’m one of those hate cilantro people, is there anything I can supplement that would go just as well with the jalapeño? Yup!!!! Deep snow… enjoying weather and totally looking forward to these lovelies for dinner! Can hardly wait! Hi Kim! I hope you love them like we do! They’re so hearty and satisfying when you’re needing some yummy comfort food. Take care! For gluten free, use Ian’s gluten free panko, and there are other GF panko products in my supermarket (ShopRite) that are less expensive and work great. Ian’s is at Mrs. Green’s in my town, as well as Acme and Stop n Shop. Discover gf breadcrumbs also by several makers. Try Whole Foods, Trader Joe’s, Jet.com….. Tip: When crumbs are a bit too large, I “roll” them first. Put into a plastic bag, use rolling pin or you can gently “smash” with a meat pounder. This is what I do and it works great. Sometimes I use my small processor, just pulsing a few times. 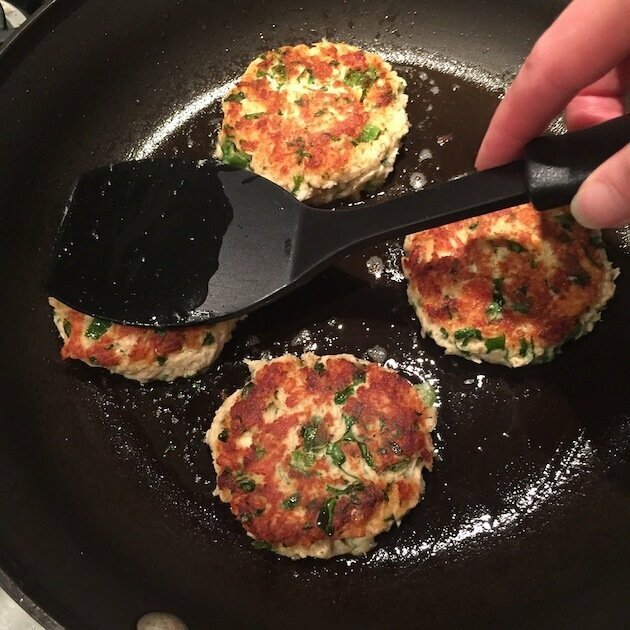 I am trying out this tuna cakes recipe as GF for our two adult daughters who medically must follow a gluten free lifestyle. I am encouraged by contributors who indicate that they have taken cooked cakes to work and re-heated for lunch. Beats even the best company cafeteria foods that could have gluten in them… Gracias por la receta (thanks for the recipe)! Thank you for your recipe. Do you think I can do this recipe as meal prep for the whole week in advance? If so, shall I keep in the freezer or the fridge? Hi Alanoud, It’s my pleasure! I do think you could make these cakes and then enjoy them the whole week. I would recommend cooking them all at once and storing them in an airtight container in the fridge. Also, use plastic wrap or parchment paper to layer between the cakes so they don’t stick together. You can reheat them in the oven, or even the microwave. Enjoy! Hi, I just love this meal. Came out delicious! Was curious to know if you think these would taste just as good baked in oven instead of doing in frying pan? Hey Kelly, Thanks so much for your feedback. They are pretty moist so I’m not sure baking them would create the same golden coating on the outside. You’ve inspired me to do some experimenting… I need to create a baked version of this recipe. 🙂 Stay tuned and thanks so much for stopping by! Made this tonight and served with zucchini fries bc I didn’t have the kale to throw together a salad…. these were absolutely amazing! Seriously had to tell myself to walk away!! Thank you for sharing!! Hi Lisa, I’ve been there done that, so I know the struggle is real! LOL I’m so glad you enjoyed the Tuna Cakes! Thanks so much for the 5 star rating and for sharing your feedback! I’m super grateful! Excited to try this recipe. Can greek yogurt be used instead of mayo in the Sriracha sauce? Hi Julie! Yes, absolutely!! Greek yogurt works great for the sauce. Hope you enjoy them – they’re a big favorite at our house. Have a fabulous holiday! So glad I found this recipe! Definitely my favorite new meal! Came across it a few hours ago and saw I had everything in the pantry/fridge so I went for it. The Sriracha aoli was great with the cakes. I also topped them with avocado and it made the dish richer. Only change I did was lime instead of lemon for cakes and aoli. I just prefer limes over lemons. Thanks for the great recipe! can you freeze these before or after cooked? Hi Kelly, I’ve frozen them after I’ve cooked them before and they turn out great. I usually reheat them on a baking sheet lined with parchment paper. I’m sure you can freeze before they’re cooked as well. Just defrost completely in the fridge before cooking. Hope that helps – take care! Just made these. Eating them right now while I’m typing this. These don’t even taste like tuna anymore. It’s like a crab cake instead. Delicious. Followed the recipe exactly except I used plain fat-free Greek yogurt instead of Canola mayo because I don’t like mayo in general. I wish I would have broken up the tuna and gave the mixture a little more of a thorough stir…but nonetheless this was really really good! Thanks for sharing! Boyfriend was like, “babe…these are really good…O_o lol! Hey Uyen, thanks for stopping by and sharing your feedback. I’m super grateful! Swapping out the mayo for fat-free greek yogurt is a great idea – same yummy flavor and less fat and calories. I’m so glad you and your guy enjoyed the tuna cakes. It’s a super delicious meal for the price! Thank you for sharing such amazing recipe! I’ve made it twice already and my boyfriend has told me both times how great they were. I’ve omitted the jalapenos both times because I did not have any in stock. I have put them on my grocery list to pick some up next time I go food shopping. 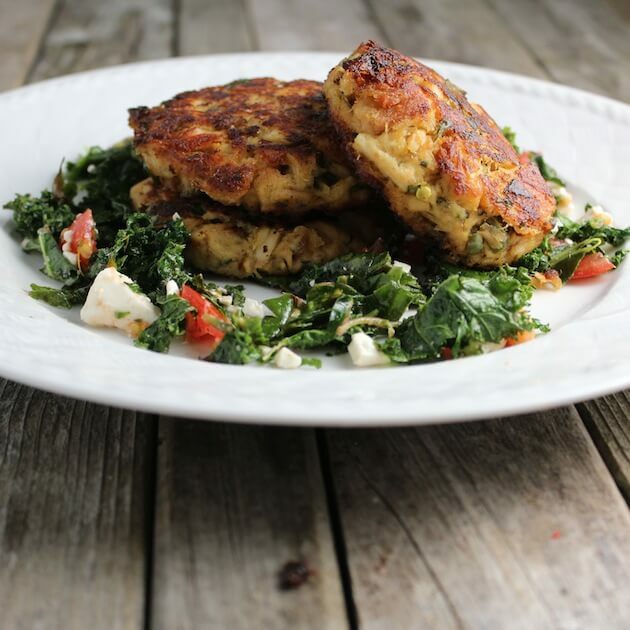 One question – how are the tuna cakes for leftovers? I am just wondering if I can make enough to have leftovers to take to work next time I make them. Hi Evelin! You’re so welcome! Thank you for your sweet words of encouragement. We always make enough for leftovers and we enjoy them. If you’re eating them cold the text will be different – not so crispy on the outside. But still the same yummy flavor. Hope this helps! I love the simplicity of this recipe! It’s so easy with ingredients I typically have in stock. Great on the fly meal, app., side, whatever! Can I make the “batter”, form the cakes and put them in the freezer? Hi Louise, that is an excellent question! I’ve never tried that with this recipe but I’m sure you could. I do that with a salmon cake recipe and they turn out great. Keep me posted – I would love to know how it goes! Made these yesterday and they were fabulous.I am following weight watchers and wondering if you know the sugar and saturated fat content? Hellman’s Canola mayo has zero saturated fat and sugar. Bumble Bee solid white tuna in water has zero saturated fat and sugar. 1 tablespoon of olive oil has 2 grams of saturated fat and zero sugar. 2 large Eggland’s Best cage free eggs have 2 grams of saturated fat and no significant amount of sugar. 2 tablespoons Huy Fong Foods Sriracha Hot Chili Sauce has 6 grams of sugar. Hope this helps – take care! Hi!! I tried these tuna cakes today and they’re delicious. I left out the breadcrumbs but it meant they didn’t stay together. Next time 🙂 Can you tell me how long the mix will stay fresh for? I’m hoping to make the rest of the cakes this evening, so in about 6 or 7 hours’ time. Will it still be ok? Thank you! Hi Sarah! I’m glad you enjoyed the tuna cakes. The mixture should be fine to make this evening as long as the it was stored in the refrigerator. If you notice some extra liquid pooling in the storage container drain it off and be sure to give it a good stir. Thanks for your feedback! Holly, thanks for the recipe! I made these last night and they were delicious. Tastes very similar to crabcakes & I hope to add this to my rotation of meals. Also, for anyone reading this, the Sriracha is a must! Thank you Aris! I appreciate the feedback! 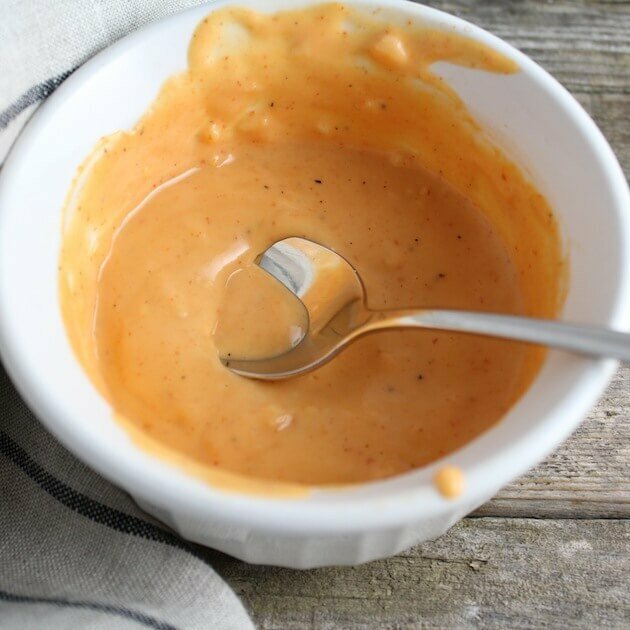 We’re big fans of this recipe and I agree completely – the Sriracha Aioli is a a perfect accompaniment!! I’m not using sriracha with 6 sugar carbs! What’s a substitute? Spicy homemade ketsup or just hot sauce? Also I’m using my own Breading mixture of fried pork rinds n grated Parmesan….oh…reg mayo…NO canola for me. Sorry…just tweaking. Hi Sydney, you do you girl – pork rinds and all! I customize recipes all the time to my taste and diet preferences. I would recommend using hot sauce in the Aioli to reduce the sugar carbs. Franks Hot Sauce has zero carbs. Thanks for stopping by – take care! Hi, I really need to know the carb break down on this since I made these and I’m on a low carb diet. I searched low carb recipes and it showed up, but now I’m told I need to track my carbs and I have no idea what the carb content would be. Your help would be greatly appreciated! Hi Jacki, Here’s the break down for calories, protein and carbs… 140 calories, 13 grams of protein, and 4-5 carbs per cake. Hope that helps! Thanks….net carb count helps ALOT! Sure thing – you’re welcome! These are SO good. But can someone please tell me why they pop so bad?? I mean I cook all the time and this was unlike anything I have ever seen. Thanks so much Lucy! I’m so glad you enjoyed the Tuna Cakes! I think you’re referring to the oil popping when you put the cakes in the pan. It sounds like water may have been the culprit – either on a utensil you were using or maybe from the tuna if it wasn’t completely drained. Usually oil pops when water droplets get in it. Here’s the science behind it… “When water droplets get in the oil, they sink since oil is lighter than water. Then the water droplets turn to steam because the boiling point of water is much below the boiling point of oil. At this point, the steam rapidly rises out of the oil and escapes with a noise and a splashing of oil.” Hope that helps! I ran across your recipe for tuna cakes while searching on Pinterest. I’ve made this recipe many times only I used one can of salmon and one can of tuna and all of the other ingredients and they were delicious. I will make almost any recipe that calls for cilantro and jalapeño peppers. I only make about 6-8 patties. They are great as left overs. They refrigerate well. If you ever have company and want to fix a great cheap meal, then this is the one to serve. Hi Ruth, I’m totally with you… I will make any recipe that calls for cilantro and jalapeños! I absolutely love them! And I love hearing that you’re enjoying this recipe. I appreciate you taking the time to stop by and share your feedback and for your encouragement! Thanks so much! Do you know the calories on one patty? Hi Julee, Each Tuna cake is about 140 calories. Hope that helps. How can i shorten this to make for 2 people? You could cut the recipe in half and that would give you 8-10 cakes. My husband eats 3 tuna cakes in a setting and I may have 1-2. That would give you enough for two meals. Hope that helps. do you need to use the bread crumbs or does that hold the tuna cakes together? The bread crumbs are necessary to hold the cakes together. I have scaled back on them a good amount already to reduce the carbs in this recipe. I made this tonight. It’s my husbands new favorite. I only used 1 jalapeño but with seeds. We like a bite. I drained the tuna well however added more breadcrumbs cuz it still felt mushy. I served it with fresh tomatoes and avocado. It was very good and I’ll be making it again. Thank you for sharing. Excelente receta. Gracias por compartirla. Thank you, Tamara! I appreciate it! I made this tonight. I left out cilantro and jalapeño to make it more kid friendly for us. I also used panko instead of bread crumbs. Served with Mexican slaw. Yum! Thanks for sharing this easy and satisfying recipe! You’re welcome Kathy! It’s so rewarding to hear you made them for your family and they were hit! I absolutely love that! And Mexican slaw sounds AMAZING! I’ll be looking that recipe up on Pinterest for sure. Thanks so much for your feedback! Hi Jennifer! Yes – you can freeze them. We do it all the time. We let them thaw on the counter and then reheat them in the oven for a few minutes. Hi Kaylee! I’ve had a few others ask about calories, carbs and protein for this recipe. The program I use doesn’t allow you to be super specific. For example, I can only type in canned tuna but not solid white canned tuna in water. So having said all of that here’s the info… 140 calories, 13 grams of protein, 4-5 carbs per cake. Hope this helps! This was so yummy! My husband is not a big fan of tuna and he liked it as well. When I make again I want to try lime juice instead of lemon and add jalapeño seeds to make it a little spicy. The patties held together great. I steamed carrots to go with it. Thanks so much Kristen! I’m thrilled you and the hubby enjoyed the tuna cakes. It sounds like you had a delicious and healthy meal. I always throw the seeds and veins into the mix as well, but I like everything hot! Great idea about using lime juice – you’ll have to report back and let me know what you think! Hey Lee, sorry the recipe didn’t work for you. If you were interested in trying them again maybe use a spatula or spoon and press the water out of the tuna while straining. If you’re not carb adverse you could also add another 1/2 cup or so of breadcrumbs and that will dry them out too. I appreciate your feedback. Hi Holly! I was searching for a tasty tuna cake recipe and came across this and your wonderful site! THE BEST TUNA CAKES I’VE EVER HAD! I have made these several times now. Sometimes I add some crushed Mexican oregano, too because I love the flavor of it. I love the sriracha mayo, too. Although, I love garlic so much, sometimes I just use a homemade garlic aioli with these. Thanks for sharing! Looking forward to browsing your site more! Hi Chad! Thanks so much for all the nice compliments!☺️ I’m so glad that you’re enjoying the Tuna Cake and Sriracha Aioli recipe! Mexican oregano sounds like a wonderful addition and you can never have too much garlic in your diet!? I’m so glad you stopped by the site and look forward to hearing your thoughts on other recipes you try. Thanks again! This is the second post for the same recipe I’ve seen. Neither mentions capers in the recipe ingredients, yet it shows up in the photo. Is it added as part of the sauce? Hi Jacquie, I only used the capers as a garnish. If you like them you could put them in the aioli sauce or even in the tuna cakes. I think they would be delicious! Look delicious! How many carbs and fiber per cake? Thanks Brenda! The carbs per cake are around 4-5 grams of carbs per cake. I’m not sure about the fiber. Hi Lauren! I’ve baked the Tuna Cakes to reheat them before but never initially to cook them. I bake my meatballs all the time and they turn out perfect so why not give it a shot? It would be time saver for sure. I’ll have to try it myself next time I make them. Thanks for the great idea! Do you know about how many calories is in the aioli? Thanks! Hi Kasey! One serving size of the aioli is about 1 tablespoon. That would be right around 40 calories. You could always use non-fat greek yogurt instead of mayo if you’re looking to cut some calories. Thanks for stopping by. Thanks so much Tiffany! I love that you were inventive and used whatever you had on hand for breadcrumbs! I’ve ground up some sesame flaxseed gluten-free crackers before as breadcrumbs myself. Great idea thanks for sharing!! Have you ever used Greek yogurt for any type of aoili? Yes – absolutely! You could swap out the mayo for greek yogurt. Fab recipe! Hubby loved it 🙂 I did alter it a bit for faster finish. I followed the recipe as directed but added 1 one can of drained tuna, extra mayo and a bit more seasoned bread crumbs and pressed it into a oiled 9×12 glass dish and baked for 45 to 60 min @ 350 until firm and a bit dry (not a fan of too moist tuna). The “loaf” cut well and was easy to serve and pack for lunches. HUGE it! This is the second time I’ve made it…delish! Hey Michele! Thank you so much and I like how you roll! A huge tuna loaf sounds wonderful!! Making all those cakes can be time-consuming but it’s sooo worth it!!! Glad you and the family enjoyed the recipe! Thanks for stopping by and sharing your “loaf” technique!!? I’ve made these twice and we love them. My husband says they are “the bomb dot com” and “just delightful ” lol. Haha I love that Amanda! 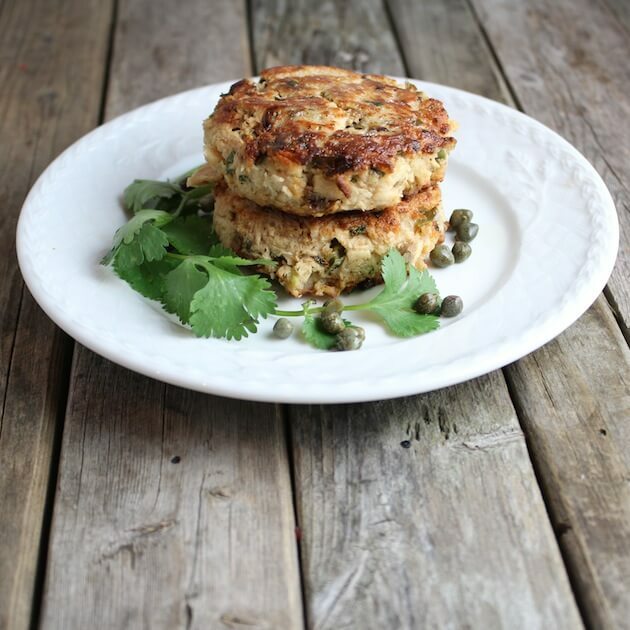 I may need to steal that line for marketing purposes…Tuna Cakes with Jalapeño and Cilantro AKA The Bomb Dot Com! Woohoo! Tell him thanks for the material. I’m thrilled that the whole family loves them! Thanks a bunch! Thank you soooo much for the amazing recipe! I made it last night for the family and even my 3-year-old asked for seconds 😀 One minor change I made was using butter cracker crumbs instead of bread crumbs to add a little buttery flavor (a trick I learned from another chef who suggested using flavored crackers whenever breadcrumbs are called for in a recipe to add a little extra oomph). Next time I’m going to add some lemongrass and see what happens 🙂 Thank you so much for this recipe, it’s awesome!! Hi Sarah! You’re so welcome!? I love that you made the recipe your own by using crackers for your breadcrumbs. I do the same thing with some gluten-free flaxseed crackers that I love. I’m so glad you and the whole family enjoy the Tuna Cakes! Thanks for stopping by and sharing your feedback!? These were a hit at dinner and the next day at work when my wife shared with her coworkers. They could not wait to make this. This will be in regular rotation. Excellent news Eric! It’s great to hear that your family and your wife’s co-workers enjoyed the recipe as much as I do. I love it when recipes allow for me to feed my people and share with others. Thanks for stopping by and sharing your feedback. Thank you so much for sharing this recipe!!!! I made it for lunch with a couple of alterations and it was delish!!!! My cilantro was a little too old and wilty so luckily i had fresh parsley on hand and used that instead. I like spice, but my 18 month old was eating lunch with us too so i skipped the jalapeno pepper and added a little garlic powder (i am a HUGE garlic fan!!!). The family loved it!!! I ate it with salad and sriracha sauce and they had it with fries. Hi Shannon! It’s my pleasure! It’s always wonderful to hear that me recipes are enjoyed by others. So thank YOU for sharing your feedback! Parsley and garlic sound like amazing additions. You could even add some green pepper or red pepper for a little texture instead of the jalapeño. Thanks for stopping by! I’m going to make this tonight looks great. Thank you Holy! Hey Emily! It’s my pleasure. Let me know how they turn out! Any idea approx how many calories per cake? Hi Amy! They are about 140 calories per cake if you use solid white tuna in water not oil. Hope that helps! Just made these and they are delicious! Hey Tammie! Yayyy – it’s great to hear that! Thanks for letting me know how they turned out.? Could I make these with canned Chicken? Hi Julia! Absolutely! If you make them with canned chicken I think a little shredded cheese added to the mixture would be nice. Please let me know how they turn out. Great idea!? These were SO good and super easy to freeze and fry up whenever I needed a quick meal. Thanks for the recipe! You’re so welcome Jessica! I’m so glad you enjoyed the Tuna Cakes! Thanks for stopping by and sharing your experience. Can you freeze the unused cakes? Yes – absolutely! I’ve frozen them many times. I like to let them defrost in the fridge. Then preheat the oven to 350 degrees, spray both sides of the cake with a smidge of cooking spray and bake them on a baking pan. You could also heat them in a skillet on the stove. Do you freeze them before cooking them or can you cook all of them then freeze some when cooled? Can’t wait to try this! Hi Kristy! I cook them and then freeze them when they cooled. Good luck and thanks for stopping by! Hi I would LOVE to make these, how low carb are they with breadcrumbs as one of the ingredients? Thanks. Hello Adie! Yes – they are indeed low-carb.? 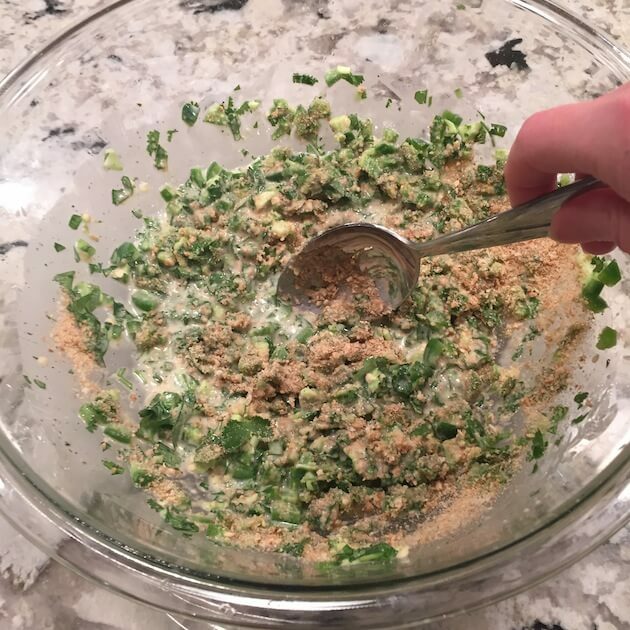 The recipe calls for such a small amount of breadcrumbs (1/3 cup and two tablespoons) that will be spread out over 15-16 Tuna Cakes. That’s less than 5g of carbs per cake. Also, I sometimes swap out almond meal for breadcrumbs when I’m being carb conscious and when I want to make a recipe gluten free. That would make them no-carb!? Thanks for the great question and please let me know how they turn! These look tasety. Think my husband might even like them. Do you think substituting the mayo for Greek yogurt would work? Thanks Chrissie! I do think you could swap out the mayo for Greek yogurt. Great Suggestion – I might give it a try myself!? Hello! I made these for my boyfriend tonight and he really loved them! If you are like me and do not like the taste of fish or anything that is “fishy” tasting, then these are not for you. They were realitively easy to prepare and the sauce was the perfect addition though I omitted the cayenne and only used one Tablespoon of siracha. Hi Jess! It’s great to hear that your guy loved them so much! And you’re pretty amazing to make them for him when you don’t enjoy fish yourself. I bet your version of the sauce was delicious! I just made these Tuna Cakes tonight for dinner. They are the bomb like tick, tick! So easy to do and yummy to eat! Thank you for a great recipe! Woohoo! “I Love it when a plan comes together.” Seriously, I love hearing that the recipe was easy and you loved it! Best. Thing. Ever. Thanks for sharing! Instead of frying them in skillet could they be cooked on something like a George Foreman grill? Hi Lori, I think the mixture might be too loose to cook on a George Foreman grill. It might get stuck down in-between the grates and really make a mess. They would do better on a flat surface like a non-stick pan or even a pancake griddle. Thanks for stopping by!